I learned about maybe having a heat pump when I was looking through my home inspection report (1.5 years after purchase of home) for something else entirely. The report called our AC units heat pumps. When I looked up the model number, it was confirmed. Then I looked at the manuals left with the heater, and there seemed to be a thermostat manual that included the Emergency Heat function people talk about, which means heat pump. However, the actual thermostats we got with the house do not match the manuals. Upgrade, right? No big deal, I thought. I'll just flip a switch or change a setting. 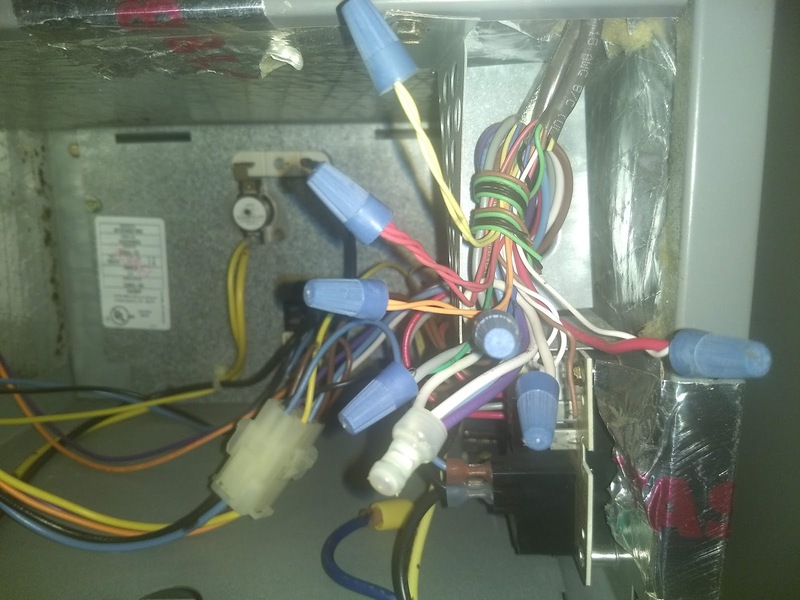 But when I found the current thermostat manual online, it required a jumper wire (not done) and an extra wire hooked up to the unit for the heat changeover valve. But that wire is supposed to be blue, with the power wire being black, but my thermostat had a blue wire to the common power. Apparently, it's “sometimes” blue. I also had two extra wires behind the thermostat. One Brown and one black. What it means, I don't know. Could be extra wires or could be the original heat changeover valve wires. After the jumper wire didn't do the trick, I eventually tried the blue wire in the heat changeover valve slot, assuming it was never the common 24 VAC. I was wrong and seemed to blow a fuse. Luckily, I had an extra fuse that was the exact match to keep searching for answers, and I didn't fry the whole unit. With the power off at the circuit breaker, I opened up the furnace in order to look for what I was missing. I saw the wires from the thermostat. I saw the blue wire connected to a larger black wire. I saw my two extra wires cut, which means connected to nothing. A black and a brown wire with nothing to do. Based on the way it looked in there, I’d have to assume whoever replaced the thermostat DID NOT make any changes inside the furnace. But then it’s a bigger, nastier problem. Another problem with the PO not getting what they paid for, perhaps. Luckily, I have a name to go with this particular mishap. 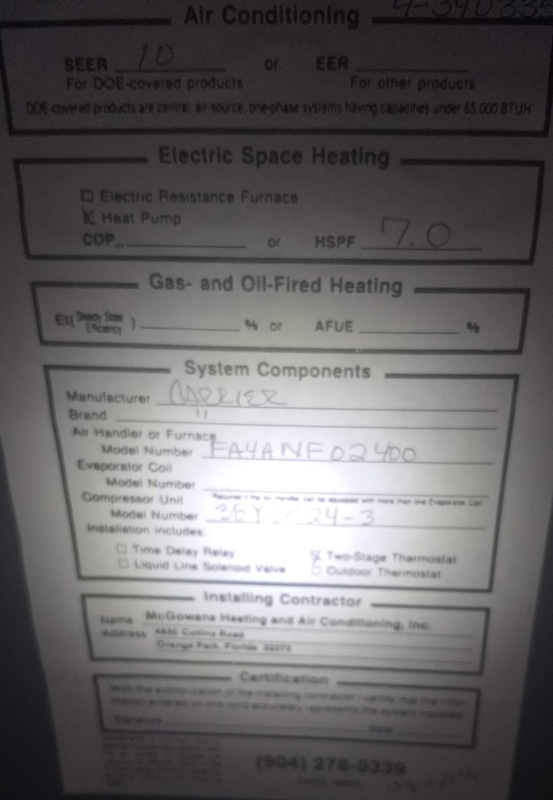 Whereas builder-grade plumbers don’t sign their work when they forget to hook up the dishwasher and reverse the hot and cold (yes, that was also the case), HVAC companies love leaving stickers for new owners to find so that we will call on the company when the unit is well out of warranty. 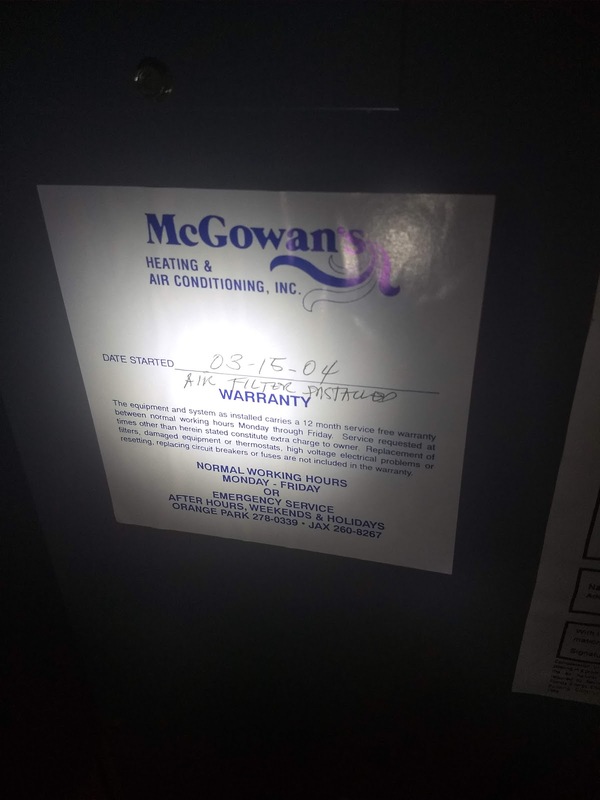 So I know that McGowan’s Heating and Air originally installed the heat pumps back in 2004. 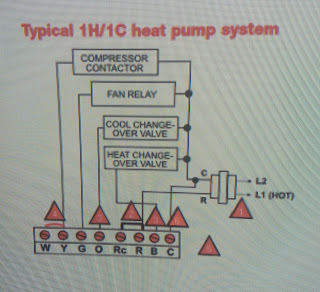 This company has a 4.8 rating on Google, so I assume forgetting to hook up a heat pump isn’t normal practice. Maybe someone else came in and monkeyed with the wires. I know someone did change the thermostats. McGowan’s even detailed what the heater is supposed to do, checking off “Heat Pump” and “Two Stage Thermostat.” Right on the sticker. But all I get is heat strips and high bills. I know a reputable company like McGowan’s would like to make sure this house hasn’t been using emergency heat only for the past 15 years. There are probably records of the installation from back in 2004. Maybe the company even takes photos when a job is finished. Maybe that wasn’t a thing back then, but I’d bet there’s more to the paper trail than just a sticker. No matter what, a technician should be able to tell me pretty quickly what’s currently wrong with the setup (and if it was his company's mistake). 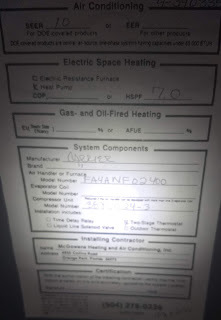 We ran emergency heat all last year because we did not realize we own two heat pumps. The previous owner may or may not have done the same for more than a decade. The thermostats were replaced, and the new ones ARE capable of running a heat pump; however, the thermostat was not hooked up to properly run the heat pump (not even close). 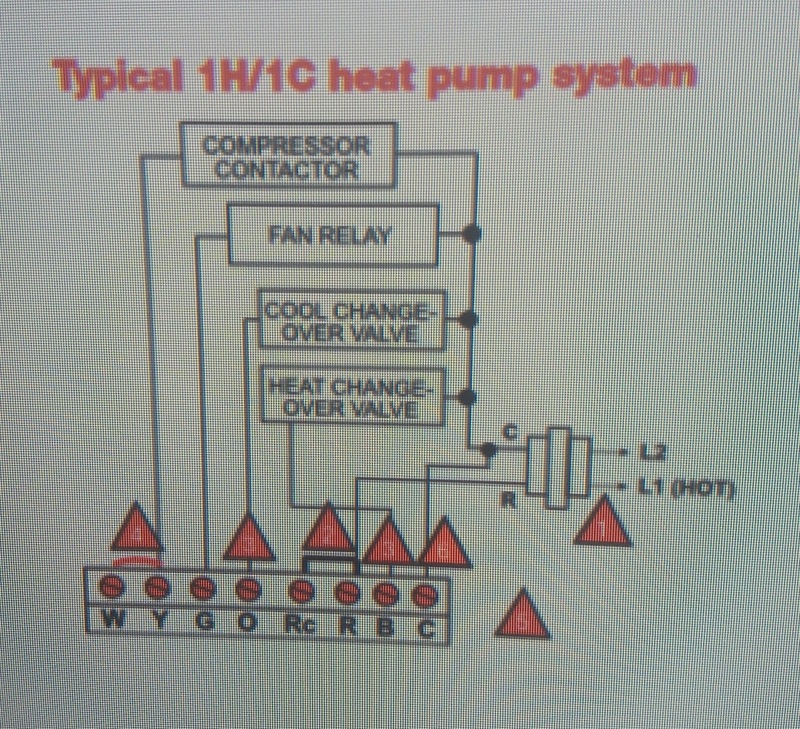 The wire to switch to the heat pump does not seem to exist. McGowan’s installed the unit in 2004 and may have the answers I need. I’ll report back with how McGowan’s handles this request to find out more about what I own. So far, I have been shut down by the previous owner when it comes to the alarm system code, the garage door code, the HOA-specified house colors, the dishwasher disconnect, and the never-once-used fireplace. Weird. But I like my odds with finding out more this time, since I’m bypassing previous owners who chose to live in squalor and never ask questions in favor of finding out more from the actual installers of the appliance. Better than trying to get an answer from DR Horton, too. If I can get some answers from McGowan’s, then I’ll try the garage door company and original alarm system company to get some other answers to the PO mystery of this house. McGowan's called me immediately when I sent an email with a link to this website. Alex found that the company, which has since changed ownership, completed the installation but had not serviced the units since then. Alex walked me through several potential fixes, most of which I'd tried by using the online Honeywell manual. He also suggested both thermostats might be bad. That seemed impossible to me. 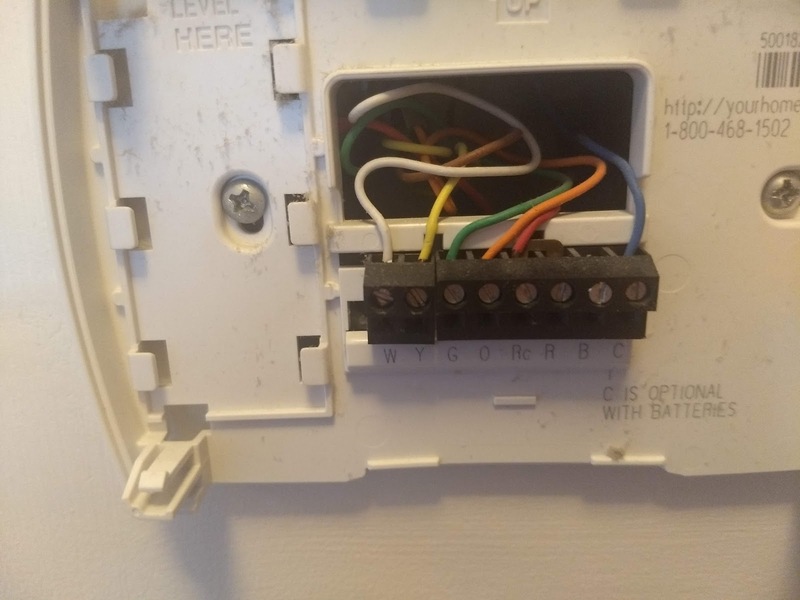 But when he told me that I could bypass the thermostat by connecting Yellow, White, Red, and Green, I thought I'd give it a shot while he was still on the phone. (Also, cut the circuit breaker before you try this.) The AC/Heat Pump turned on! 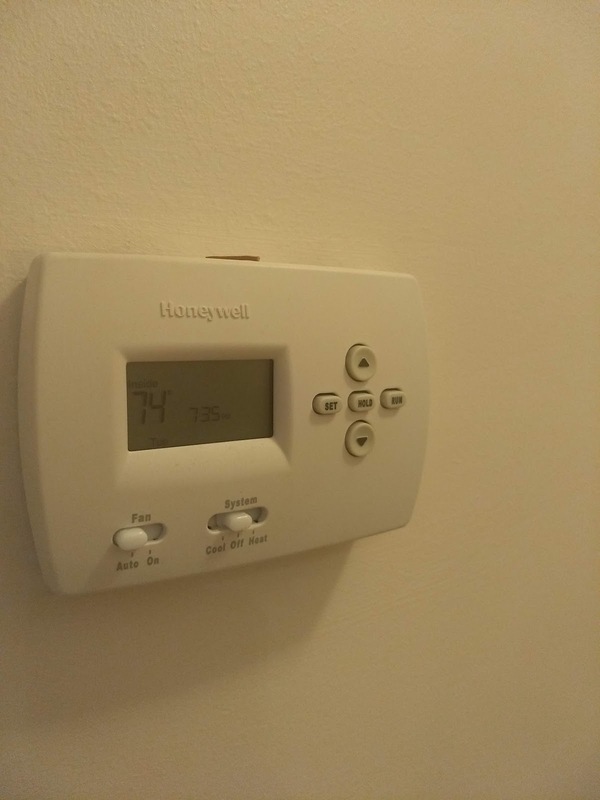 It's possible something is missing from the connection to the thermostats. Maybe it's the jumper issue, and I never got it right. Maybe it's the setting that the thermostat mysteriously would not allow me to access in setup mode. The good news is that I probably have working heat pumps. Maybe I'll get a Honeywell Pro 9000 or Nest like Alex recommended. But the point is that one PO mystery is finally solved, and I also have a heating and AC company that I'm willing to call when I need work done. All of the companies that generally ignore 15 year-old complaints should take note: when I need a service call and one or two new units, I'll go with the company that offered 45 minutes of free advice first. It's like my website design business when I give out all kinds of advice. The people I help may not need me right now, but they'll remember me when they need something more than advice on blogging.